BUDGET SUPERMARKET LIDL is set to create 600 jobs over the next two years as part of a ramped-up recruitment drive. These won’t be limited to the shop floor, with positions being created in its head office in the areas of buying, admin, accounting and finance, and marketing. The positions come at a time of rising fortunes for both Lidl and its fellow German cut-price outlet Aldi. Figures released earlier this week by Kantar Worldpanel Ireland – the consumer research authority that provides a measure of how supermarkets are performing – found the pair were still behind traditional market leaders SuperValu, Tesco and Dunnes, but is showing strong signs of growth. The combined market share for the two was up almost 1% on June figures to 23.1%, making their joint share bigger than that held by Ireland’s biggest retailer SuperValu, which saw a slight drop to 22.5%. 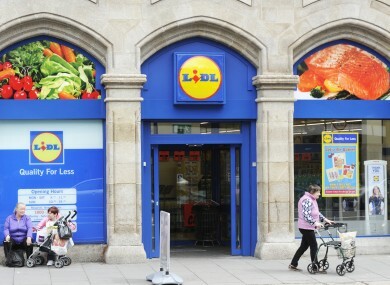 Lidl has been operating in Ireland since 2000, with a report by DKM Economic Consultants estimating last year that the company has invested €1.4 billion in the Irish economy in that time. It currently operates 146 stores across Ireland and has around 4,000 employees in – meaning that this new announcement will see its workforce grow by around 15%. “It is encouraging to see recruitment across all parts of the business which will provide opportunities for those with a wide variety of skills. I am particularly pleased that much of this employment will be spread across the country in Lidl’s stores, regional offices and distribution centres which is a key objective of the government’s regional jobs plan. Email “Lidl's plans to boost operation will create 600 jobs ”. Feedback on “Lidl's plans to boost operation will create 600 jobs ”.